My daughter LOVES Kettle corn and wants to buy the huge $7 bags every time we go to the farmer's market. I don't buy it very often, but she would eat the whole bag by herself if I did. So I got to thinking that maybe I could make Kettle corn on my own using the popcorn that was already in my pantry. I've made 2 batches so far and they've been a hit both times. Even my son ate some and he's not a popcorn fan normally. 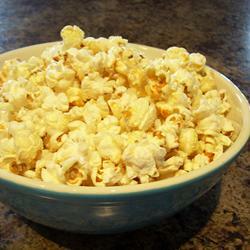 I have no idea how much homemade kettle corn costs, but it can't be much more than 50 cents per batch. I found a recipe online and used that the first time, but last night I couldn't find it so I just "winged" it, and Hubby liked this batch better than the rest. Mix sugar, salt and cinnamon in a small bowl or mixing cup. Put oil and corn in a fairly deep skillet (mine is almost wok-like) and heat on medium heat until oil starts to bubble. At this point put the lid on the skillet. When you hear the first few pops shake the skillet with the lid on to move the corn around in the pan (like you've seen people do when they make popcorn). When most of the corn has popped sprinkle the sugar mixture over the corn, replace the lid and shake some more. Heat for a few seconds more until all corn has popped then remove from heat and enjoy!